If one of your resolutions this year is to amp up your creative juices, either of these recent reads might be helpful! New York: Riverhead Books, c2015. Another book by an author I am generally dubious about... Gilbert's Eat Pray Love has to be one of the books I've disliked most in recent years. Argh, so self centred! But I gave this one a try because of its topic. And it's not bad. I like the focus on personal, everyday creativity. There are some pretty interesting points that she makes. The idea that we just have to show up, to be ready to do the creative work, is key. Persistence is the point that resonated most with me. She covers other areas, like Courage - managing and working through fears and expectations of greatness or horribleness in one's art. Or Permission; to give yourself the name of artist/creative person without having to be "successful" to do so. There are many things I enjoyed and noted down from my reading of this book. But like many other readers, I have mixed feelings about it. Unfortunately, Gilbert's disingenuous argument that the arts are not as necessary as things like plumbing or roofing, that you shouldn't quit your day job, that most people won't succeed so just be happy with your mediocre hobby (well, I am also being a bit disingenuous here and perhaps overstating her case in my annoyance) bothers me, coming from someone who has made quite a career in the arts, via her creative life. I think she was trying to reduce the sense of perfectionism & fear that keeps people from beginning anything, but perhaps went a little far in the opposite direction! Anyhow, this is supposed to be a recommendation for a book to help you with your creativity! And if you aren't bothered by some of the things I've mentioned you may really love this one. Even I was inspired by it, and found some good takeaways. Gilbert still seems awfully self-satisfied to me, but if this book were distilled down into something more like the length and breadth of her TED Talk on the topic, it would be just right. As the blurb for this book states: creativity is not magic; it is a learnable skill that any person or business can master. So, equal but opposite approaches to the genius of creativity between these two books! This book has much more of a freestyle, creative feel in its own right as a physical object. The pages are covered by random large font statements, colour, illustrations, lists for the reader to write things in, and there are even some photos tossed in there. Usher both recognizes that creativity shows up differently for different people and states that creative people can use that creativity outside of their original "field". For example, he always thought that his creativity was linked to music, but began to realize that his creative way of looking at the world, of understanding things, was applicable to his other interests in tech and business. So one's creativity can be brought to focus on varied areas of life. I love this. It's so true, and important to recognize the many sides to a creative mind. He ponders his own experiences, and shares his thoughts on the two pillars of creative success: freedom and structure. Everything he says ties these two elements together. I enjoyed this book and found it quite inspiring, and fun to read. I must admit I saw David Usher speak at a library conference a couple of years ago, and he performed one of the creative exercises he discusses in this book: it was delightful in person, and I found the book just as charming as he was as a speaker - he is quite charismatic. 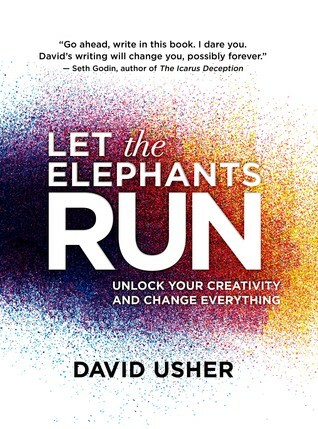 So this may have coloured my experience of reading this...but it's still a good read for anyone interested in creativity and how to foster it in everyday life. Another book on creativity that is based in the author's world is Twyla Tharp's The Creative Habit. It's a little more intense, perhaps, and delves more deeply into the necessity for discipline as an artist. But it's one that I find very, very inspiring, even if I will never be a full-time dancer, or artist of any sort, myself. Interesting post! I've been going through a slightly crafty, creative phase lately and I think half the battle is loosening up and enjoying yourself, and accepting that it doesn't matter what you produce as long as you enjoy it. I think I would disagree with your first author - it sounds like she's being a bit dismissive - a hobby or pastime is something you love doing and to brand it as mediocre or less worthy is a bit snobby! Nevertheless if it gets people creating, that has to be good! I found these both worthwhile, but I ended up with tonnes of quotes pulled from Elizabeth Gilbert's book; it was just the right book at the right time for me, I think. (Found Twyla Tharp's book a good one too: maybe I should reread that one and see how well I remember it.) Do you have any others lined up on your creativity shelf? It's funny because when I first read Gilbert's book I really liked it and had lots of things marked. Only when I reread it did some of the "buts" arise for me. I also liked Eric Maisel's Mastering Creative Anxiety and his slightlyh misnamed Rethinking Depression, which I think is a wonderful book about living with a creative and meaning-oriented mind. Reading about creativity is fun! It sounds like the second one was more your liking. It is! Yes, I really liked the second one a lot. 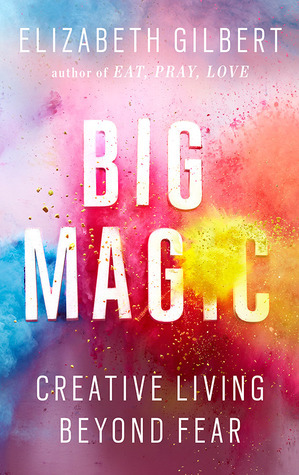 I'm currently reading Big Magic! Will post when I'm done but so far I'm enjoying it. I'm glad to hear it! I did enjoy it as a whole & found some good quotable bits too. I didn't even read Eat, Pray, Love and I felt that way about it! I did enjoy Big Magic though for its, as you sum it up, focus on personal, everyday creativity. Yes, I was surprised by how much I didn't hate it, considering ;) I like a lot of different voices on this subject so this was a good addition.